The Goring was the hotel of choice for Kate Middleton on the night before her wedding, proving its status as one of London's most luxurious hotels. Home to award-winning afternoon tea, a classy dining room and an Edwardian style bar, it's got all the ingredients for a five-star experience. The only luxury London hotel that is still owned and run by the family that built it. A trip back into a quieter, more civil age, the Goring hotel is still in the hands of the family who have run it since 1910, and they are clearly determined not to let the incivilities of the twenty-first century anywhere near it. The building was designed by Edwardian architect John Evelyn Trollope and is a fine example of Edwardian Baroque, while the gorgeous public areas are decorated in true antique style. There are sixty nine individually designed suites, with the new suites designed by Nina Campbell and guestrooms by Tim Gosling and Russell Sage. Staff at the hotel are kind, efficient and polite and the location is simply stunning - offering the tranquillity of a country home in central London. The Goring is also home to award-winning afternoon tea and an award-winning dining room, currently being run by Executive Chef Shay Cooper. Served in the hotel's lounge bar and terrace, the afternoon tea is award-winning. 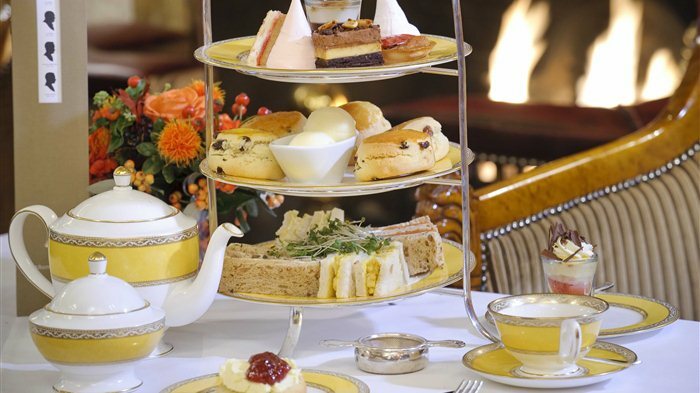 Voted the best place for Afternoon Tea in London in 2013 by The Tea Guild, The Goring Hotel sits cheek by jowl with Buckingham Palace and has been owned by the same family for three generations. Appropriately, given its royal neighbour, Kate Middleton spent the night before her wedding here and David Linley is responsible for the decor in the restaurant. His signature classic yet elegant style making the dining room surprisingly unstuffy. The Goring was praised by The Tea Guild judges for the flexibility of the venue where guests can enjoy tea by the fire in colder winter months or take tea in the garden outside when the sun shines. But it's The Goring's "elegant surroundings, faultless presentation and friendly, efficient and knowledgeable staff" that really impress. Chef Shay Cooper serves modern British food at this elegant restaurant. Designed by David Linley, The Goring Dining Room succeeds in being elegant without being stuffy. Chef Shay Cooper has recently been appointed as Executive Chef, introducing a new menu of modern British food. Formerly the Executive Chef at the Bingham Hotel in Richmond, he was awarded a Michelin star in 2010 and 2011, and named the Catey's Hotel Chef of the Year in 2010. His new menu at the Goring Dining Room features dishes such as salt marsh lamb, served with hot pot potatoes, haggis, pickled red cabbage and mint; Cornish fish stew, with a shellfish broth, razor clam, scallops and red mullet; and day boat plaice fillet, served with cucumber, dill and potted shrimp butter. Firm Goring favourites Eggs Drumkilbo, the signature Lobster Omelette, which now stars as a main course, and the the Beef Wellington - famously on the Goring's menu for over 100 years - keep their position on the menu. A five-star bar that's ideal for an intimate drink. From cheap budget accommodation to luxury 5 star suites see our discounts for hotels, including Hilton London Olympia Hotel from 70% off.